Hungary went to the polls on Sunday 8 April. Ruling party Fidesz and its far right racist leader Viktor Orban have secured a third consecutive term in parliamentary elections after winning two landslide victories in 2010 and 2014. Tonight Fidesz, Hungary’s far right populist party is celebrating its election victory. They will be buoyed by the news that they had won their third supermajority in a row. Across Europe and the US racists, right wing populists and fascists were falling over themselves to congratulate Viktor Orbán and Fidesz. They rightly believe that is another major victory for the far right in Europe. Outside of Budapest the opposition parties won only three constituency seats – a MSZP MP in Szeged, an independent in Pécs and a Jobbik MP in Dunaújváros. Fidesz and Jobbik’s combined vote is similar to 2014 general election. Both parties have seen modest increases in their share of MPs. Close to 60% of Hungarians voted either for a far right populist party or a fascist party. This is a truly frightening level. This has been a decisive win…in the future we are going to be able to defend our mother country. We will soon be hearing what Orbán’s plans are for his third term. But it is already clear that he will be emboldened by the election victory and he will be even more strident against migrants, Muslims and of course the Roma. He has already announced that a package of “Stop Soros” laws – aimed at cracking down on civil society and migrants, using antisemitism as cover – will be adopted in May. Four other key features of his previous regimes have been authoritarianism, ultra nationalism, socially conservative policies and law and order. His dream of creating a one party system that fuses state and nation could become a reality. 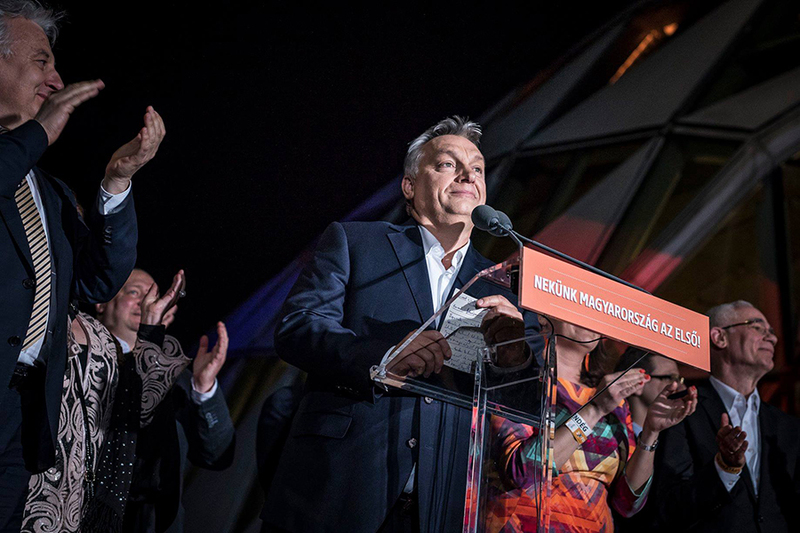 On an international level Orbán’s victory will strengthen the far right across Europe. It will almost certainly see a further political realignment with authoritarian parties in Poland, Austria and other central and eastern European countries. Fidesz press officers were happily telling the media tonight that the next government was going to crack down on NGOs and “disloyal” journalists. Jobbik a fascist party is now Hungary’s second largest party. This is a fascist organisation that has used paramilitary groups to attack and harass Roma communities and Jewish groups. Jobbik have defied many anti-fascist academics that claimed it was like other Eastern European far right groups in that it would rise very fast and then implode. In order to win more votes Jobbik’s leader Gabor Vona, attempted to present Jobbik to the media as a “mainstream nationalist party”. But this turn failed to translate into more votes. Yesterday he kept his promise that if Jobbik lost the election he would stand down as leader. I have no inside knowledge to the political maneuvers taking place inside Jobbik. But I will forward two theories put to me by Hungarian anti-fascists. One tells me that Vona never believed that Jobbik would win but hoped Jobbik would significantly increase its number of MPs. He failed in this but hopes that by calling a snap leadership election he will win it and control the party for a further four years. Another friend tells me, his “modernization” strategy alienated many inside the party and its failure means they want to see a new more right wing leader. This would see Jobbik return to more popular policies and actions against the Roma and migrants. Either way a leadership election will reveal the tensions inside Jobbik. The second casualty of the night was Gergely Karacsony, the leader of the centre-left MSZP he also stood down. On any level it was a bad night for the party. The MSZP has pursued a neo-liberal aenda more vigorously than any other party in Hungary. It’s been more pro-capitalist than the right. Up until 2009 it was one of Hungary’s two main parties. Its privatisation policies and failure to tackle the real poverty that exists in the country has alienated its core vote and has seen its share of the vote collapse. Here is a table of its general election results from 1990 to the present. 2014: 25.6% (this was its vote as part of a coalition of liberal and centre left parties. Fidesz have won a major election victory. They are going to try and turn Hungary into a one party state that will significantly curtail democratic rights and freedom of speech. The danger of Fidesz is for all to see, but the question is can they be defeated. One of the most depressing facts about this election is that not one party spoke out in defence of the Roma. Talk of electoral pacts between the left/centre parties and Jobbik to defeat Fidesz will not do. History teaches us that fascism cannot be accommodated. If Jobbik had its way it would drive out the Roma from Hungary, smash the left and trade unions. The only way to defeat Fidesz is for a principled opposition to develop. One that challenges head on the racism of Fidesz and Jobbik and puts forward a radical policy of eradicating the chronic poverty that haunts Hungary’s workers and poor. It is a dark night in Hungary, but the students who have marched and voted in massive numbers against Fidesz are a bright star in this night sky. Fidesz leader Orban has declared victory. He has gone over the 133 seats needed for a “supermajority” that will mean the far right and increasingly authoritarian Fidesz can make constitutional changes. Jobbik leader Gábor Vona has offered his resignation – Jobbik has increased its number of MPs but not by the substantial jump predicted in early post-election projections. It is not yet clear whether Jobbik will actually part with Vona, who has been leader since 2006 and overseen its rise. It should be remembered that as well as its parliamentary presence and control of some local town halls, fascist Jobbik also has a huge paramilitary force. If the Index projection is accurate – and we stress it is only a projected result – then it would be a victory for Fidesz and a big result for Jobbik, which would see a big increase from 23 to 34 MPs and have become the second biggest party in Hungary’s parliament. In the run up to this election I spent a lot of time travelling around Hungary. Everywhere I went there were Fidesz anti-Soros posters (see below). Soros has become Fidesz’s number one enemy and the campaign has deliberately antisemitic overtones. Fidesz despise Soros because of his support for refugees, defence of the EU and the fact that he is Jewish. Fidesz portrays him as the “powerful Jew” promoting liberalism and pulling the strings of all of Fidesz’s political opponents. The message is not lost on racists who regularly scrawl the posters with foul antisemitic graffiti. The first poster, produced by Fidesz was the most used in the election as is often referred to by Fidesz supporters as the “laughing Jew”. The second one I have put side by side with a Nazi poster produced in the 1940s. So far no party or serious pollster has predicted the result. So while we wait for the results to come in here are a few facts worth looking at. Figures from Hungary’s National Election Office published half an hour before the polls closed showed that 68.13% of 7.9 million eligible voters had cast their vote. The figure is significantly higher than the final turnout of 61.73% in 2014. The Guardian are reporting that Orbán’s spokesperson Zoltán Kovács said that Fidesz were not expecting to win a supermajority. A supermajority is when a party or coalition is able to win two-thirds of MPs or more. This enables them to govern and pass laws without the support of any other party. Tell everyone that they [all the other parties] want to settle 10,000 migrants in Hungary this year. Tell everyone that migration is the blight that slowly but surely devours our homeland. If the settlement of migrants takes place there will be nothing to support families or to pay pensions. Tell everyone that mass migration threatens the everyday security to which we are accustomed. With mass migration comes a greater threat of terror. It is clear as day that where there is mass migration, women are threatened with violent attacks. Poling stations close at 7pm (6pm GMT) and the ballot count will begin soon after. The ballot result is expected to be in at 10pm (9pm GMT), however exit polls are expected shortly after the close of the polling stations. Hungary’s fragmented opposition parties agreed to withdraw candidates in 29 of Hungary’s 106 first-past-the-post constituencies, including 13 in the capital, Budapest. This agreement did not include Jobbik. The large numbers of students voting is a really positive sign, they have been politicised by the large protest opposing Fidesz’s education policies. However Fidesz are fighting hard for every vote and are out canvassing in the city in unprecedented numbers. At this mornings press conference Gabor Vona, leader of the fascist Jobbik Movement told journalists that he expected a “surprise” result in the parliamentary elections and that he would resign and put his fate in the hands of his party if they don’t win. At 3pm (local time) over 53% of the Hungarian electorate had already voted. This is a record high. Some analysts claim this is an anti Fidesz vote, however other pollsters claim that there are huge turnouts in rural areas, this will probably benefit Fidesz. To kick it off here is some background information about the election. 1. Who are the major parties? Hungarian voters will elect 199 members into parliament in a single round. A total of 106 seats can be won in single-member constituencies in a first-past-the-post system. Party and a national party list fills another 93 seats. Winning candidates have their surplus votes added to national party lists. Over the last eight years Fidesz has made a number of electoral changes. In 2011 Fidesz reduced the total number of seats from 386 to 199 and redrew the electoral boundaries. This was blatant gerrymandering that both increased the number of seats Fidesz could win and weakened the oppositions electoral chances. Also a second voting round was eliminated, denying parties the option of clinching deals between the rounds, this has played a major part in the splintering of the current opposition. In April 2015, Jobbik’s Lajos Rig defeated the Fidesz candidate in a parliamentary by-election in Veszprém County. Below is a more in-depth analysis of the Hungarian election. On 8 April, Hungary will go to the polls in its parliamentary election. But this will be like no other general election in Europe. The main challenger to the authoritarian far right populist party Fidesz is the outright fascist party Jobbik. At present, opinion polls show Fidesz on around 52%, with Jobbik at 17% and the centre left MsZP on 12%. This is an election whose repercussions will be felt far outside the borders of this poverty-stricken central European state. Hungary is becoming a beacon and organising centre for fascist and the far right across Europe, and is rapidly building a far right block with its allies in Poland and other neighbouring countries. There is an old Hungarian joke that was often told during the dark days of the Stalinist regime. Now it has resurfaced – but this time with a new target. Every morning Viktor Orbán’s looks at himself in a mirror and says, “My eyes are my mother’s, my nose is my father’s, my chin” — the Hungarian word for chin and state is the same – “is mine”. Over the last eight years Viktor Orbán and his Fidesz government have undermined democracy and have turned Hungary into an “illiberal” state. The government has pushed through constitutional changes that have undermined democracy, weakened Hungary’s judiciary, waged war against NGOs and imposed restrictions on press freedom. That is only half the story: Orbán vehemently opposes multiculturalism and immigration. During the refugee crisis of 2015 Orbán encouraged Hungarian immigration officials and police to attack refugees arriving at its borders. Orban himself referred to the refugees as “poison” and erected razor-wire fences on Hungary’s southern borders to keep them out. In the run-up to the election Orbán’s attacks on migrants have intensified and he has called for a global alliance against migration. At a recent rally in Budapest Orbán said: “Christianity is Europe’s last hope.” With mass immigration, especially from Africa, “our worst nightmares can come true. The West falls as it fails to see Europe being overrun”. Roma people – a substantial minority group – are a regular target for official and unofficial racism in Hungary. The Fidesz government is also whipping up antisemitism. It has found the “perfect” enemy in George Soros. Proposed legislation, dubbed the “Stop Soros” law, is calculated to curb the influence of the Hungarian-born Jewish billionaire George Soros, who founded the Central European University and donates large amounts of money to human rights groups. Soros has supported Hungarian charities that help asylum seekers and migrants. 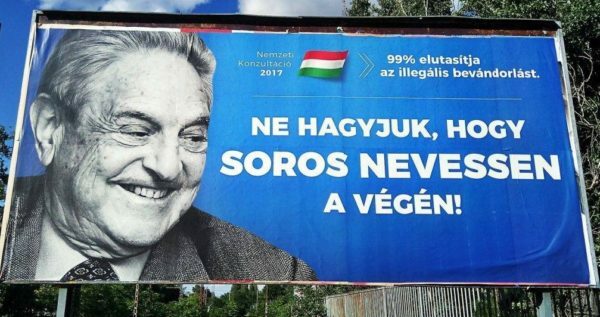 Everywhere you go in Hungary you see posters featuring a picture of Soros’s grinning face and underneath a slogan reads, “Don’t let Soros have the last laugh”. Human Rights Watch rightly claims this poster, “evokes memories of the Nazi posters during the Second World War showing ‘the laughing Jew’.” These posters are almost always covered in anti-Semitic graffiti with slogans such as “keep Hungary Jew Free” and “stinking Jew” daubed on them. Fidesz wasn’t always a right-wing populist party. It was founded in 1988 as an anti-Communist liberal party. After its poor result in the 1994 elections, Fidesz morphed into a conservative-type party. Under Viktor Orbán’s leadership Fidesz gained power in 1998 and governed Hungary in coalition with two other right-wing parties. But it narrowly lost the 2002 elections to the Hungarian Socialist Party (MsZP). It has continued to move rightwards and become increasingly authoritarian. Since 2010 Fidesz has governed Hungary and has adopted more authoritarian methods of rule. Its main political challenge has come from Jobbik, and it is in an attempt to undercut Jobbik that Fidesz has adopted an ever more right-wing agenda. Jobbik is electorally one of Europe’s most successful fascist parties. It currently has 24 MPs, three MEPs and is running second in the opinion polls – although it is well behind Fidesz. Formed in 2003, it is a party rooted in Hungary’s fascist past. It has led violent pogroms against the Roma and is involved in vigilante attacks on migrants trying to enter Hungary. Jobbik has used a paramilitary force – the Hungarian Guard (Magyar Gárda) – to intimidate opponents and minorities. The huge paramilitary organisation was banned in 2010, but it continues to operate under a number of names and guises. Fidesz’s move to the right and Jobbik’s electoral success have prompted attempts by Jobbik’s leadership to “modernise” the party and adopt a more moderate-sounding political programme. So for example in its 2018 manifesto it claims it is a “modern conservative people’s party” one which “rejects the chauvinism of the 20th century”. The media have taken Jobbik at its word and accept this “road to Damascus” moment. In a desperate attempt to undermine Fidesz, sections of the “liberal intelligentsia” have called for a coalition between the left-liberal parties and Jobbik. This is an appalling and dangerous move – behind the veneer Jobbik remains a deeply fascist organisation. 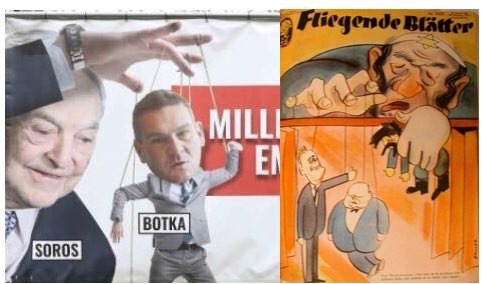 Jobbik has toned down its political message, but it is just copying the “Eurofascist” stratgey og parties such as the French Front National and the British National Party. Jobbik may present a moderate face to the media in Budapest, but take a closer look at its political practice in the local areas that it controls and a nasty, more openly Nazi party reveals itself. Jobbik has rejected the unity call for its own reasons. But it is worth keeping an eye on results of the local election in Hódmezővásárhely on 25 February, where Jobbik and all the left of centre parties have stood down in order to give an independent candidate a clear run at Fidesz. UPDATE 26 February: Fidesz suffered a humiliating election defeat last night in the mayoral election in Hódmezővásárhely. This was a Fidesz stronghold and a city that has been governed by Fidesz and the right since 1990. There was a 63% turn-out, higher than in any previous local election. Márki-Zay, the independent candidate for mayor, was supported by every major Hungarian party from the greens (LMP), the social democrats (MSZP) all the way through to the fascist Jobbik. The result will of course give a boost to every one who is opposed to the right-wing authoritarian Fidesz party. But the opposition parties are playing with fire if they think uniting with Jobbik is a way to politically defeat Fidesz. This is a dangerous alliance and will further legitimise Jobbik. No one should doubt the fact that if Jobbik is given half a chance it will destroy the left and liberal parties and put in place a regime far worse than Fidesz. Jobbik’s nazi politics and its paramilitary force should not be forgotten. Up until 2006 it was one of Hungary’s two major parties. But two crises ripped its heart out. The first was the Hungarian revolt of 2006. Between 17 September and 23 October 2006 a wave of protests and riots shook the Hungarian government and state to its core. This protest movement was triggered by the release of a private speech made by the then Hungarian MSzP prime minister Ferenc Gyurcsany. In his speech, he revealed that his party had lied to win the 2006 election. He even boasted that he had achieved nothing in his four years of office. The protest movement was the first the country had seen since 1989. For over five months, protestors occupied the square in front of the Hungarian Parliament. There were daily demonstrations, which often ended in riots. Jobbik, which was at that time a tiny organisation, played a central role in this movement. By February 2007 the movement had petered out. The second crisis to rock the MsZP was the 2008 economic crash. Hungary saw its GDP fall by 6.8%, the largest drop in Europe, and unemployment hit 33%. According to a European Parliament report in 2015, a third of the population lives in poverty. The MsZP were in office during the crisis and this, coupled with its unconditional support for the free market, saw its support haemorrhage. Since 2010, the MsZP has been unable to challenge Hungary’s slide into authoritarianism and has done little to oppose the virulent racism aimed at the Roma population or stem the growing tide of antisemitism. The collapse of the MSzP brought about the political breakthrough for the new authoritarian right in Hungary. Unless the polls have got it seriously wrong, Fidesz look set to win its third parliamentary election in a row, by a large margin. The party looks likely to win over two thirds of the seats and gain a so-called “super-majority”. Hungarian law – introduced by Fidesz – allows any party with over two thirds of the seats is allowed to pass a new constitution and other laws without the support from other parties. A Fidesz victory would highlight once again the continued growth of far right racist populism across Europe and it will also see a further entrenching of the far right across Central Europe, in particular in neighbouring Poland, Austria, the Czech Republic and Slovakia.